I know I had blogged about dragonfruit before. But I can’t resist showing this photo I have just taken of the red flesh version. I bought two bottles of red dragon fruit wine which is Made-In-Malaysia. In Kuala Lumpur, to be exact. The fruits are from Kluang, Johor. I bought them because they are unique. I can’t say much about the taste yet as I haven’t try them except what I tasted at the food exhibition in Penang. I copied something from the site for information. Do surf over if you wish to learn more about dragonfruit. They even teach you how to make wine! Pitaya, origin and native from South America, is a popular fruit over there. It has been brought by Holland and France into Asia. Now, the main cultivate are in Vietnam, Malaysia and Taiwan. It is a nutritional fruit. 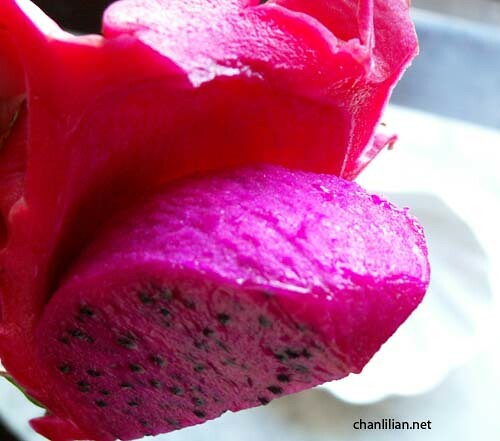 Nowadays, the Pitaya has been cultivated on a large scale in Malaysia as well as in other country. Normally we catteries the Pitaya into three type. How the Pitaya look like? Visit our web, and you will get the better understanding of this wonderful plant. Usually, The Pitaya is grown in the tropical lowlands. It is a tropical fruit. It can be grown with organic fertilizer, and without any pesticide and chemical. Therefore, the Pitaya gain its reputation on the market as a healthy fruit. The fruit is juicy, with a subtle fruity flavors. Red Pitaya is pleasant to eat and when sliced the fruit is especially attractive.